Is It Hateful To Believe In Hell? Bernie Sanders' Questions Prompt Backlash : The Two-Way The senator challenged a Trump nominee over his belief that Muslims are condemned, calling his statements "Islamophobic" and "inflammatory." Evangelical Christians say that's a troubling argument. Sen. Bernie Sanders, I-Vt., speaks at a rally in Omaha, Neb., on April 20. Sanders has been criticized for a recent line of questioning toward a Trump administration nominee, which focused on the man's religious beliefs about damnation. A low-profile confirmation hearing on Capitol Hill this week raised eyebrows when the questioning turned to theology — specifically, damnation. Sen. Bernie Sanders of Vermont pressed Russell Vought, nominated by President Trump to be deputy director of the Office of Management and Budget, about his beliefs. "Do you think that people who are not Christians are condemned?" Sanders repeatedly asked, challenging that belief as Islamophobic. 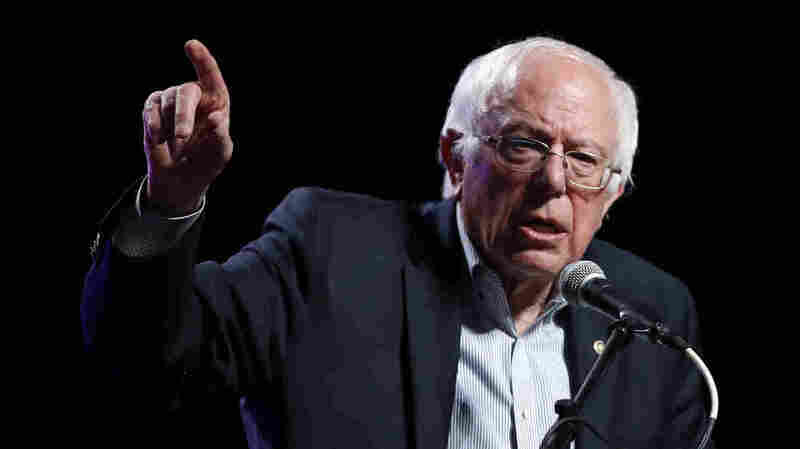 Christian organizations have denounced Sanders' questioning as amounting to a religious test for public office — one that would disqualify millions of people. Polls show about half of all Christians in the U.S. believe that some non-Christians can go to heaven. But particularly among evangelicals, the traditional view of damnation remains widespread. How did hellfire come up in a confirmation hearing in the first place? In 2015, an evangelical Christian college suspended a tenured professor who said that Muslims and Christians worship the same God. That's a belief shared by many Christians, but not all; Wheaton College said it contradicted the school's statement of faith. Vought, an alumnus of Wheaton, wrote a blog post last year expressing support for his alma mater. He quoted a theologian who said non-Christians have a "deficient" theology but could have a meaningful relationship with God. Vought disagreed. "Muslims do not simply have a deficient theology," Vought wrote. "They do not know God because they have rejected Jesus Christ his Son, and they stand condemned. " Ahead of Vought's confirmation hearing, that quote was picked up by advocacy groups concerned about whether Vought could serve all Americans fairly. Sanders brought up the passage, again and again, in the hearing. He asked Vought if he thought his statement was Islamophobic. "Do you believe people in the Muslim religion stand condemned?" Sanders asked. "What about Jews? Do they stand condemned, too?" "I'm a Christian," Vought repeatedly responded. "I understand you are a Christian," Sanders said, raising his voice. The senator is Jewish and has said he's not particularly religious. "But there are other people who have different religions in this country and around the world. In your judgment, do you think that people who are not Christians are going to be condemned?" "I believe that all individuals are made in the image of God and are worthy of dignity and respect regardless of their religious beliefs," Vought said, while also emphasizing "the centrality of Jesus Christ in salvation." "This nominee is really not someone who this country is supposed to be about," Sanders said, announcing that he'd vote against him. Did focus on a nominee's faith cross a line? Sanders was criticized almost immediately for focusing on a nominee's religious principles instead of qualifications or behavior. His office has defended the senator's questions. Russell Moore, president of the Ethics & Religious Liberty Commission of the Southern Baptist Convention, called Sanders' comments "breathtakingly audacious and shockingly ignorant," and deeply troubling even if they are legal. "This is not some arcane or obscure private opinion being held by this one individual," Moore told NPR. "The language that Sen. Sanders, finds so disturbing — 'stands condemned' — is language right out of the New Testament." Moore says there's nothing hostile about Vought's comments. "In Christian theology, no one is righteous before God," he said. "[Evangelical] Christians don't believe that good people go to heaven and bad people go to hell. Christians believe that all of humanity is fallen." And Moore argues there's a fundamental misunderstanding at play: Secular people often assume that beliefs are "just ideas and opinions" that can shift. But for religious people, he says, "we don't believe that we are constructing our faith. We believe that it's been handed to us by God." A question of belief, or a question of behavior? Hussein Rashid, founder of the religious literacy consultancy Islamicate L3C, doesn't agree that the belief itself is a problem. "I think we have to accept that there are theologies that are what I would call exclusionary, that only certain people will go to heaven and certain people will go to hell. They are not inherently Islamophobic or anti-Semitic," Rashid said. "It's when it turns into action that we start getting worried. " He, like Moore, emphasized that these beliefs are not particularly unusual. "Exclusionary theologies are far more prevalent than I think we realize," Rashid said, noting many Americans' reticence to talk about religion in public. A substantial number of Christians believe Catholics are going to hell, he noted. Different Christian sects, and individuals, have varying interpretations of damnation. The traditionalist view is that eternal suffering awaits all who do not accept Christ; on the other end of the spectrum is the universalist belief that everyone will be saved. And then there are disagreements about what hell actually is. 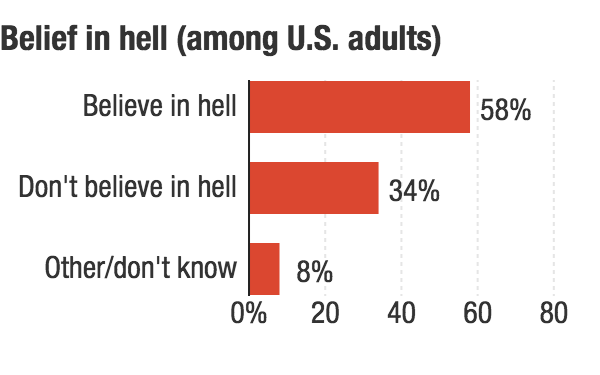 In short, it's hard to pin down exactly how many Americans believe non-Christians are going to hell — but polling data suggests a strong minority. A LifeWay Research survey, conducted online with a much smaller sample, found that 40 percent of Americans believe those who do not accept Jesus are bound for hell. But it's complicated: Some of those people appear to also believe other faiths can attain salvation. At any rate, Vought's belief is not a fringe view. "Most conservative evangelical churches believe that faith in Christ is necessarily for salvation," Moore says. And it's not unique to evangelicalism or Christianity. The Quran is quite clear that there is a hell, says Mohammad Hassan Khalil, a professor of religious studies at Michigan State University and author of Islam and the Fate of Others. The general view is that those who reject the message of Muhammad are damned, he says, but just like in Christianity, there's a vast spectrum of beliefs. You'll see "a popular preacher who has many YouTube hits saying that all non-Muslims go to hell," he says, and at the same time, "you'll get other people who say there are multiple paths to heaven." Khalil says belief in hell does not have a clear-cut implication for behavior on Earth. "If I believe all non-Muslims go to hell ... it can lead me to look down upon them, see them as just fuel for hell, and not really take them too seriously. Or I could be motivated to want to save them," he says, "and be unusually kind and nice to them in the hopes that they will convert." NPR asked Sanders' office if the senator would have challenged a devout Muslim who believed non-Muslims are condemned to hell, in the same way he challenged Vought. Sanders' spokesman said yes. Moore of the Southern Baptist Conference says Sanders confronting a Muslim would be equally problematic. "We've been working for religious freedom for everyone," said Moore, who has spoken up in defense of mosques. Rejecting a nominee for their religious doctrine is "a troubling trend, and if this were the direction that American public officials were to go this would be very dangerous for American democracy," he said. "We've seen what happens when the state sets itself up as a theological referee."